Classical music is one of the most sublime forms of communication. So it is a paradox that the classical music community is so poor at communicating, as is being shown by the current furor over cuts in arts funding around the world. 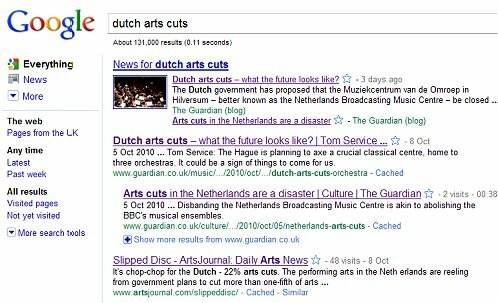 There is no doubt that the cuts inflicted on the arts in Holland are truly terrible. The ripple effects of the cuts, which include the total closure of four radio orchestras and a magnificent music library, threatens music, dance, and theatre throughout the country. A little reported increase in the tax on tickets in performance venues from 6% to 19% will force halls to close and will discourage adventurous programmes and new commissions. All of which has been imposed without notice and selectively by a right-wing government with racist links. Holland is currently the worst victim, but on the other side of the Atlantic orchestral players in Detroit are now striking against pay reductions. So it may seem to be the wrong time to be writing a post that does not scream 'cultural genocide' very loudly. At which point a few reminders may be in order. This blog has always passionately defended the importance of classical music. It joined the campaign against the closure of the Dutch classical station Concertzender two years before Dutch arts cuts were making headline news elsewhere and it has uniquely documented how the strike by BBC musicians in 1980 saved a great orchestra. As I have said, the cuts inflicted on the arts in Holland are truly terrible. But what is notably lacking from coverage by the classical music community is any recognition of the underlying cause of the budget reductions already imposed in Holland and Detroit and those that will inevitably follow elsewhere. The underlying cause is that in almost every Western economy an ageing population means expenditure is outstripping income. And the only solution is to cut expenditure, whatever the colour of the government. Everyone is going to have to share the pain. At the risk of repeating myself it is clear that the cuts in Holland are selective, disproportionate and linked to other agendas. But much of the current protest activity simply illustrates the shortcomings of a Twitter driven sound byte culture and runs the risk of confirming the widely held view that classical music is a niche indulgence that is out of touch with reality. Of course we need to vigorously protest against the cuts. But we also need to publicly acknowledge the economic crisis that is their underlying cause. And we need to recognise that classical music has made itself a soft target by being too elitist and too dependent on public subsidies, by failing to connect with a young audience, by being ageist and by having a poor track record in race, gender and sexual preference equality. To gain public support we need to show how classical music can contribute towards expenditure savings. Most importantly we need to show how classical music is going to put its own house in order and make itself less of a soft target in the future. An online petition against the Dutch cuts can be signed here. "Classical Music" will reinvent itself any time soon. For example, he fact that Symphony Orchestra musicians in beleaguered Detroit are out on strike is, sadly, astounding. Pliable, in your recent articles you have questioned the over-conservatism of the classical music industry with regards to things such as programming, presentation, dissemination and context. I would add financing to this list. As I mentioned, it has long been the assumption that the classical arts lose money, hence the reliance on donations. However, would it not be possible, as in the case of the pop music market, to create a profitable industry? The only thing that is preventing this from occurring, is lack of suitable market mechanisms. Thus, I propose the establishment of a bond market suited to the funding of arts projects, as governments routinely do for financing. A creditor-led funding model would encourage arts organisations to become financially responsible. Creating these financial instruments would also have the effect of encouraging commercial interest in the classical arts, thus encouraging excellence. Imagine a rating agency devoted to arts organisations, ranking not only the artistic health of an organisation, but also the financial health. Well established organisations (such as the Berliner Philharmoniker) would be senior to riskier and newer projects (such as the staging of a new opera by a contemporary composer, with a scratch orchestra and cast). Maybe this is not the solution, however hopefully this will provoke some discussion as to the nature of finance in the industry. Thanks for this post. This is important. All of the arts need to rethink how they present their ROI proposition when it comes to funding. If the powers that be thought classical music was truly a good investment it seems unlikely they would cut funding. I truly believe that classical music does present a real and profound ROI, but it is currently not well communicated. Part of the problem is that the ROI is much less tangible. We need to come up with ways of highlighting this ROI. One way might be to work to make music a more integral part of our communities. Whatever the answer really is, I think those of us in the classical music world may need to start thinking more like business people. I come from Latin America and the attitude I see on this post and the comments is truly shocking in light of what happened in Argentina in 2002. There, after many years of going along with austerity, following an old recipe first used in 1930's Europe (specifically France), huge violent protests led to the president fleeing for his life on a helicopter. If you all had bothered to read the Financial Times every once in a long while, you would realize that to "grin and bear it", to accept the cuts as necessary, is exactly what one should not do. It is very simple: you cut government spending in the middle of a recession, when business won't make up for it, and tax receipts will fall, because overall expenditure will only fall further than it already has. Musicians in state funded orchestras, just like bureaucrats, are also consumers. So you get into a vicious circle in which cuts only lead to further cuts as tax revenues keep falling, as has been happening in Ireland. To raise sales taxes, the most regressive of all in that they hurt the poor and middle classes more than the wealthy, in such a situation, is like trying to stop a house fire by dousing it with high octane gasoline. These policies are madness, specially in light of the private wealth still sloshing around, lately going into commodities, raising the prices of food just as an early winter is setting in, profiting nobody but speculators. Compared to the attitude taken by the Argentinians in 2002, and the Spanish and many others all over the Continent just a couple of weeks ago, your own seems craven, an apology for oligarchy, specially given the misery talented orchestra musicians have had to endure in the US and UK for decades. I am but 30, but I have been listening to classical music for many years, and there's no doubt that Britain's contribution to it has been crucial, specially in the last century. Where would we be without the BBC Proms and the BBC's regional orchestras, among many other world class ensembles funded by state money? An inept government who cares only for the wishes of philistine, irresponsible bankers is threatening to do away with all that - what, abroad, any sane human being would be immensely proud of - and all you do is stand back, or worse, give a sullen nod of approval while the crime is committed right in front of your very eyes? Xalkan, thanks for that. All shades of opinion expressed in a civilised manner are given an airing here and your comment is welcome. But having said, that some clarification is needed. My post was about the recent cuts in arts funding in Holland, not the UK where the BBC orchestras reside. I also mentioned the Detroit Symphony dispute. In the US the average salary for an established orchestral musician is $104,650, which is hardly a “misery” wage. “Of course we need to vigorously protest against the cuts. But we also need to publicly acknowledge the economic crisis that is their underlying cause”. Hardly a “sullen nod of approval”. Burying our heads in the sand, ignoring the reality of increasing social costs caused by an ageing population and hoping that the Western governments will flee in helicopters is exactly the lack of realism that I was cautioning against. Returning to the UK, the funding of the BBC needs explaining. The BBC and its orchestras are not State funded, although the entirely separate BBC World Service is. The BBC is independent of the State and is funded by a model that is very similar to the subscription fee paid elsewhere for cable and satellite channels. Every UK household with TV receiving capability pays an annual license fee, but unlike commercial subscriptions this fee is mandatory. At present there are no announced plans to cut the license fee, although the Conservative party have indicated that this is a possbility. Cuts in State funding for the UK arts via the Arts Council are likely. Many performing groups will have indications of forward levels of funding in the next few weeks. Staying with the UK, as a regular reader of the Financial Times you will know that the paper supports what you term as an “inept government who cares only for the wishes of philistine, irresponsible bankers”, or as it is better known, the Conservative party. You will also be aware that the FT supports economic interventionism. I hope the above helps to clarify my post. Reading your post I do have to admit I wasn't well informed on the matter of UK arts funding - specifically the BBC TV license fee, which I know is not very popular, to say the least. But I still think the population crunch is not to blame for the present crisis, which the government is using to push cuts on arts funding . Instead of bailing out the banks, the State should have forced wealthy investors to "take a haircut" as they say in the business. That, together with cuts to the defense budget, for such white elephants as the Trident ballistic missile program, would have allowed arts funding to stay relatively steady. After all it contributes to the economy through tourism, while most Trident funding goes to the US, where the missile is made. Draconian cuts across the board will help no body - in fact they will only worsen the problem of pension funding by causing a fall in tax revenues, as I explained in my previous post. And the FT is not a Tory paper - its editor Martin Wolf's criticism of budget cuts - as an answer to recession - goes against both Tory and "Third Way" Labor economic policy dogma, which wants the state out of the way no matter what. But to call the FT a supporter of "economic interventionism" is outrageous, preposterous: such policies are associated with Socialism. For a daily catering to the banker & broker crowd to support state market intervention sounds like a proposal for a Monty Python sketch, rather than a business plan. For the 2010 general election, however, the Financial Times declared their support for the Tories, who were re-elected after 13 years out of power despite failing to gain an overall majority, forming a coalition with the Liberal Democrats after Labour leader Gordon Brown admitted defeat in his efforts to keep his party in power. Then I suppose the editorial position of the FT can not be taken seriously. What I dislike about the cuts is not their existance but the fact that they are entirely nontransparant. Nothing was said why the whole MCO (ie Radio) was to be abolished. Not one word, not one justification. They only said we need 200 milion €, and this is how we will save them. Well, I suggest they sell a Rembrantd or two from the Dutch musea and they will earn more then 200m. And as much as I realize how ludicrous this suggestion is, so is theirs. On the other hand it is beeing invested in animal police and more police in general. While they will put more than 1000 people on the street without work, whey want to protect the animals. How odd does that sound!? They also would like 3000 more policemen, pretending Holland is a dangerous place to live in. Well it's not! And it's a complete fascist policy: scare the people and they will follow you wherever - look at the USA. I don't mind patronage but the problem is, Europe does not have the amount of rich people the States have, that would donate 100.000 a year for a cultural event. I'm the first one to say: let's save. But then we must ALL save and not just some on the expence of the others. And the new government does not get that message. It's not as if they will lower the wages: they will abolish them. With a single stroke of pen. And as we know we build the sound and quality of classical ensembles throus decades not weeks and once they are gone, they are gone. For ever. "the US the average salary for an established orchestral musician is $104,650, which is hardly a “misery” wage"
You might want to clarify this. This is probably the median wage of member of the top 7 or 10 US Orchestras only. Also, any serious discussion should consider pay in terms of net income, of pay after taxes - Federal, state and local. An American citizen earning 104K has to give 28% of that to the Federal govt., plus, in the case of someone living in Detroit, close to 10% to city hall and the Michigan state govt.. That comes up to more than a third of gross pay, leaving barely 65,000 in disposable income. For working, married couples tax rates are even higher. Then come the costs of transportation and health, which in the US are anything but negligible, unlike in Western Europe. Public transportation is, at best, often deficient, and the health care system in the US is famous for being the most expensive around the world. Then, if this top orchestra musician has children, due to the worsening state of public schools, which in many cases have done away with music education following the mantra of austerity, together with his/her spouse they will have to put together the money to send them to a private school, to insure they don't end up "falling through the cracks", leading a much less comfortable life than those of their parents. The effort a professional orchestra musician has to put to maintain the quality of his/her playing level is great. They deserve a relatively comfortable middle class life, not a walk down a tightrope, above an increasingly fragile safety net. This can't be emphasized enough. Living in Los Angeles almost my entire life, I've seen the effects on the local economy that the collapse of the industrial base in the 60's > the collapse of the military industrial complex base in the 90's (I had a nice middle-class upbringing due to my dad's union job helping to make nuclear missiles) > the ongoing collapse of the music business (the rock business made a mint here due to the quality of the recording studios and rehearsal spaces and LA being catnip to British rockers) > the ongoing collapse of the movie business. Those at the very tops of those industry aren't affected, but it's all the people/companies that service the mid > lower-level people in those industries that got/get clobbered. Suddenly, there's no demand for a nice car or an expensive house or getting your suits dry cleaned or eating out instead of cooking in and on and on. Again, spot on. Add in to your mix student loans, which for orchestral musicians who weren't born in to wealth can be astronomical. Considering that the generally accepted level for entry in to the upper class is $250,000/year before taxes, that $104,000 doesn't really rate.